It was a long and grueling winter, but with temperatures rising and sunshine returning to the Tri-State, it's safe to say spring is finally here. The days are warm, nights are cool and it's the the best time of year to grab a pack and head to the woods. That might sound great in theory, but for those who have never backpacked before, it can be intimidating. Outdoors expert Bryan Wolf will never forget his first backpacking trip because it lasted 170 days. The Cincinnati native's first time was hiking the entire Appalachian Trail . Needless to say he had a lot of learning curves along the way. 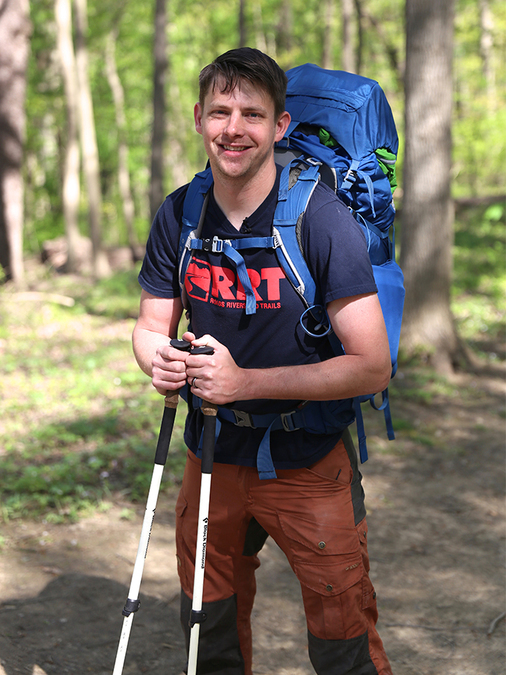 Today, as a co-owner of local outfitter store Roads, Rivers and Trails in Milford , Wolf teaches several beginners backpacking classes throughout the year. He hopes to inspire others and break down barriers for them to get outside. "One of my favorite ways to start my backpacking presentation is to tell people your experiences are your mistakes," Wolf said. He suggests people start simple so you don't end up in a situation where you need something, but your car is a three-day hike away. Practice on loop trails and go out for day hikes before embarking on a week-long venture. "The first thing is just seeking out information," he said. "Seek out somebody that's done it before so visiting your local outdoors stores or a friend." Buying gear can also be another deterrent for beginners. It's often confusing and expensive, especially if you're looking to purchase items classified as "ultra" light. The lighter the product, the more money it costs. However, Wolf said that while you'll accumulate gear over time, start with a good-fitting pack. "A good-fitting pack places most of the weight on your hips and partially on the front of your shoulder," Wolf said." That's what's keeping it from falling backwards." The right backpack will help transporting gear with more ease. It's also important for beginners to start with a checklist before hitting the trail. Here are just some of the items that Wolf suggests for a beginner's first weekend trip. Wolf breaks them down into these categories. Core items: Backpack, tent (or hammock if you prefer), sleeping bag, sleeping pad, camp stove, water filter, food, map, compass, small towel, clothes (including rain gear), water bottle. Side items: Map, compass, first aid kit, pocket knife or multi-tool, headlamp. Luxury items: Camp chair, trekking poles, camera, music, journal, book, etc. Most backpackers will start with the basics, then add more luxury items over time depending on how much weight they can handle. It takes time and practice to figure out what works best for you and your needs. You don't want to be too weighed down, but you also want to enjoy your trip. "You realize 'I'm doing this for fun,'" Wolf said. "'This is my vacation and I want to be comfortable and it's worth being up off the ground relaxing in a nice camp chair and having a cup of coffee.' Having these moments that are important to you -- don't skip out on those." 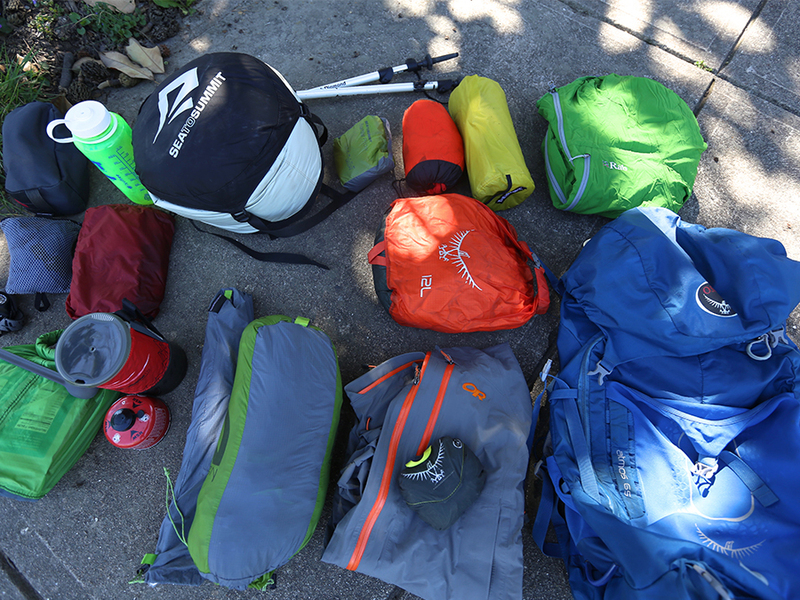 Once you've assembled your gear, making it all fit into a backpack is another story. Luckily, Wolf demonstrates in the video in the media above how to make it all work. The most important advice he gives is making sure you're evenly distributing the weight and not sacrificing important items. Backpacking can be difficult, but it's well worth the practice. Over the years since his first trek across the East Coast on the Appalachian Trail, backpacking has led Wolf to adventures all over the globe, including Iceland, the Canadian Rockies, Jasper National Park and the Red River Gorge. Aside from the scenery, Wolf's favorite moments stem from spending quality time with those traveling with him. "The conversations and the moments you can have with other people are so real when you're not surrounded by distractions," Wolf said. "When I'm planning the trip, it's more about the people." So get out there and make some "experiences." You never know where they might lead. For more on classes and events offered by Roads, Rivers and Trails visit http://roadsriversandtrails.com. Follow more Wild Cincy adventures on Instagram @wildcincy and Emily Maxwell on Twitter @EmilyWCPO .